Sift together almond flour and powdered sugar twice. Add 40 gr egg whites and beat until it is like a paste. Add gel food coloring. In a clean medium bowl, beat the egg whites on low speed until foamy. Preparing the Italian meringue. In a small pot, mix the crystal sugar and the water. Stir on moderate heat until sugar melts and the syrup starts to boil. Once cooked, stop stirring and cook the syrup until it reaches 120 ° C (measure with a thermometer). During this time, the remaining 40 grams of egg whites are shaken with a blender until they become white and larger. To them with a continuous break with a trickle is added the syrup. The egg whites break down at a fast pace until they thicken and become shiny. Then beat the egg whites on low speed until the mixture begins to cool. To the colored almond paste, add 3 times the Italian meringue, stirring with a spatula. To test if it is ready, drop a small amount of batter on a plate. If the small peaks dissolve into the batter on its own in about 10 seconds, the batter is ready. If not, fold couple more times and test again. Be careful not to over-fold. Line 2 baking sheets with parchment paper. Transfer the batter into a pastry bag with a round tip. Pipe about 1.5-inch rounds about an inch apart on prepared baking sheets. Tap the baking sheets firmly on the counter a few times to get rid of any air bubbles. finger, then it’s ready to go into the oven. While waiting, preheat the oven to 170°C. 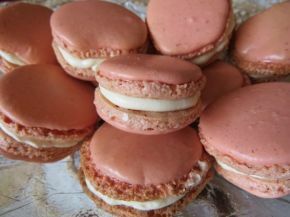 Bake the macarons one sheet at a time for about 15-20 minutes. It’ll take longer for larger macarons. Leave the oven door slightly open, so that no moisture is collected. The macarons are ready when they come off the sheet easily. Тransfer the macarons to a wire rack to cool completely. In а water bath bowl mix the egg white and sugar, beat them slightly with a whisk until sugar is melted. Transfer to a clean medium bowl. Stir with a mixer at high speed until the mixture increases in volume and thickens. Continue to stir at lower speed until it cools and reaches room temperature. Stir in the butter in three batches (it should also be at room temperature so the cream does not cross). Add vanilla extract and continue to mix until smooth. The stirring continues until the mixture thickens and becomes homogeneous and fluffy.